Music programs are faced again with cutbacks as states across the country grapple with huge budget deficits. These reductions have already been felt in many Michigan districts. Utica Community Schools, the second largest school district in the state, has eliminated their Fine Arts Coordinator position and most of the Intermediate Schools Districts laid off their Fine Arts Consultants this year. Many arts teachers returned to school in September faced with larger class loads and more buildings to cover. Some districts have even begun to cut programs. The Lake Shore School District in Montcalm County, for example, has eliminated all of their fine arts programs. Although the state budget outlook for next year is even grimmer, it is possible to influence the priority the arts receive in your own district through consistent and continuous advocacy. This article is intended to help you develop an advocacy plan, as well as give you quotes that you can cut and paste into advocacy materials. Before you can be an effective advocate, it is essential that you become knowledgeable about the most current educational issues and the current political views toward music education. The state and federal government now consider the fine arts as a core academic subject, along with math, science, reading, and social studies. This new level of importance for the arts can be seen in Education, Yes!, the new Michigan legislation, as well as in the new Bush education plan, No Child Left Behind. To help ensure that all students meet challenging State academic content standards and challenging state student academic achievement standard in the arts. With this new focus on the quality of arts education for all students, it is imperative that schools develop fine arts curricula based on the state standards and benchmarks. These standards and benchmarks, as stated in the Michigan Curriculum Framework (MCF), lay the foundation for all fine arts instruction in every public elementary, middle and high school in the state. Aligning your district curriculum lends credibility to your programs and helps to ensure their rightful place within the school day. I can’t count how many times I have heard teachers complain that parents rule the school. It is a fact that parents play a large role in the decisions made by a school or district. Armed with this knowledge, it is imperative for music educators to inform all parents of the importance of the arts and to cultivate them as advocates for their students and for arts programs. There are numerous direct and indirect ways to communicate your message to parents. Some indirect ways may include posting research facts on marquees and community bulletin boards or providing table tents to local restaurants. You can write articles for the school newsletter or even provide a recording of your group to be played when callers are placed on hold at your school. The ideas are only limited by your creativity. A more direct method is preferable if you are trying to recruit parents for active involvement in your programs. To inform the parents of your students (or other target groups) you need to develop a method to communicate with them on a regular basis. Start with a welcome back letter at the beginning of the school year and continue to update parents on a monthly or quarterly basis. Be sure to include information about the curriculum and how it will benefit their children. Include research quotes in these communications to back up your claims. I have listed some quotes below that might be useful in parent communications. of ten adults and teenagers who play instruments agree that music making brings the family closer together. . In a 1999 Columbia University study, students in the arts are found to be more cooperative with teachers and peers, more self-confident, and better able to express their ideas. These benefits exist across socioeconomic levels. .
Music students demonstrate less test anxiety and performance anxiety than students who do not study music. .
Martin Gardiner of Brown University tracked the criminal records of Rhode Island residents from birth through age 30, and he concluded the more a resident was involved in music, the lower the person’s arrest record. .
College admissions officers continue to cite participation in music as an important factor in making admissions decisions. They claim that music participation demonstrates time management, creativity, expression, and open-mindedness. . The U.S. department of education recommends that middle/junior high school students take courses in the arts, stating “Many colleges view participation in the arts and music as a valuable experience that broadens students’ understanding and appreciation of the world around them. It is well known and widely recognized that the arts contribute significantly to children’s intellectual development.” . The nation’s top business executives agree that arts education programs can help repair weaknesses in American education and better prepare workers for the 21st Center. .
Students who participate in school band or orchestra have the lowest levels of current and lifelong use of alcohol, tobacco, and illicit drugs among any group in our society. .
A majority of the engineers and technical designers in Silicon Valley are also practicing musicians. .
Ninth grade students in a Chicago arts program achieved reading scores that were a full grade level higher than students not in the program. All other variables, including race, gender, and socioeconomic status, were equal in this study. . The scores of elementary instrumental music students on standardized math tests increased with each year they participated in the instrumental program. .
A research team exploring the link between music and intelligence reports that music training is far superior to computer instruction in dramatically enhancing children’s abstract reasoning skills necessary for learning math and science. . When researchers analyzed the NEL: 88 database of the U.S. Department of Education, which tracked 25,000 students over a ten-year period, they discovered that students who were involved in music scored higher on standardized tests than students not taking music courses. This finding was consistent for students of all socioeconomic backgrounds. . There seems to be a constant battle for students between high school music teachers and foreign language teachers. Many counselors recommend to parents and students that if their child is college bound, they should forget about music classes because college admittance officers are more interested in applicants having multiple years of language instruction. It is often important to educate your school counselors about the importance of the arts and to point out the value that most admissions officers place on student participation in music programs. If you want to go the extra mile, call the admissions office of the top three or four colleges that your students will attend and ask about admissions requirements and how they score applications. Arming yourself with credible information is essential to your success. 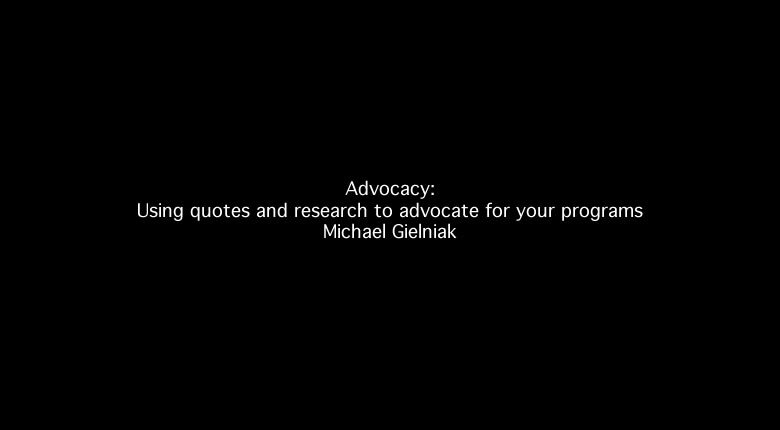 The following quotes may also be helpful in making your argument to the school counselors. College Board identifies the arts as one of the six basic academic subject areas students should study in order to succeed in college. .
On 1999 SAT, music students continued to outperform their non-arts peers, scoring 61 points higher on the verbal portion and 42 points higher on the math portion of the exam. . Advocacy initiatives must also include administrators and school board members because they ultimately make the financial and curriculum decisions that affect your programs. Teachers tell me stories all the time about the support (or lack thereof) they receive from building principals. Administrators usually control music budgets and the priority music programs receive in the master schedule. For these reasons, it is imperative to continuously preach your message to them and enlist parents in your efforts. I have listed a few quotes below that seem to resonate with administrators and board members. The arts are recognized as a core subject in the Goals 2000: Educate America Act approved by both houses of Congress in 1994. When researchers analyzed the NEL: 88 database of the U.S. Department of Education, which tracked 25,000 students over a ten-year period, they discovered that students who were involved in music scored higher on standardized tests than students not taking music courses. This finding was consistent for students of all socioeconomic backgrounds. Ninth grade students in a Chicago arts program achieved reading scores that were a full grade level higher than students not in the program. All other variables, including race, gender, and socioeconomic status, were equal in this study. In 1999 Columbia University study, students in the arts are found to be more cooperative with teachers and peers, more self-confident, and better able to express their ideas. These benefits exist across socioeconomic levels. The nation’s top business executives agree that arts education programs can help repair weaknesses in American education and better prepare workers for the 21st Center. I have just scratched the surface in terms of quotes and research dealing with the importance of music education. A true professional should keep abreast of innovative practice in one’s field by reading the professional journals. There is also an endless supply of websites that that can be used to find the latest information. If you are interested in searching on your own, I suggest you start with a couple of common sources. The Arts Education Partnership is an organization committed to increasing resources for quality education in and through the arts in schools, schools districts and partnering arts and cultural institutions. Champions of Change and Critical Links are two documents they have compiled that are widely quoted by arts educators. You can access Champions of Change on the web at http://aep-arts.org/Champions.html and Critical Links at http://aep-arts.org/CLTemphome.html. The Eric Database is another great way to access the latest educational research. ERIC is the world’s largest source of education information, with more than 1 million abstracts of documents and journal articles on education research and practice. You can find the search engine at http://ericir.syr.edu/Eric/. If you have questions or comments regarding advocacy or other arts education issues, feel free to contact me through The Center for Creative Learning and Teaching icon below. Michael Gielniak has been working with students around the globe for 20 years. He holds degrees from VanderCook College in Chicago, Ludwig-Maximilians-Universitaet in Munich, and Oakland University. Mr. Gielniak has studied with such conductors as Leonard Bernstein, Sergiu Celibidache, Nicholas Harnoncourt, and Guenter Herbig, and has worked with professional and youth orchestras throughout Europe. Mr. Gielniak began his teaching career in the Chicago Public Schools and served as the Fine Arts Coordinator in the Berkley School District and as the Fine Arts and Gifted and Talented Consultant for the Macomb Intermediate School District. In his position at the Macomb ISD, Mr. Gielniak worked with the 21 Macomb County school districts to develop standards-based arts programs, implement professional artist residencies and raise funds through local, state and federal grants. He continues to work extensively with the Michigan Department of Education (MDE) and districts around the state. Mr. Gielniak has been involved with several notable projects at MDE that include managing the development of arts content for the Clarifying Language in Michigan Benchmarks (MiClimb), serving on the rubric development committee for Education, Yes!, and reviewing Michigan’s teacher preparation standards in the fine arts. Mr. Gielniak is currently developing the Center for Creative Learning and Teaching, an educational think-tank involved in research, staff development and advocacy.